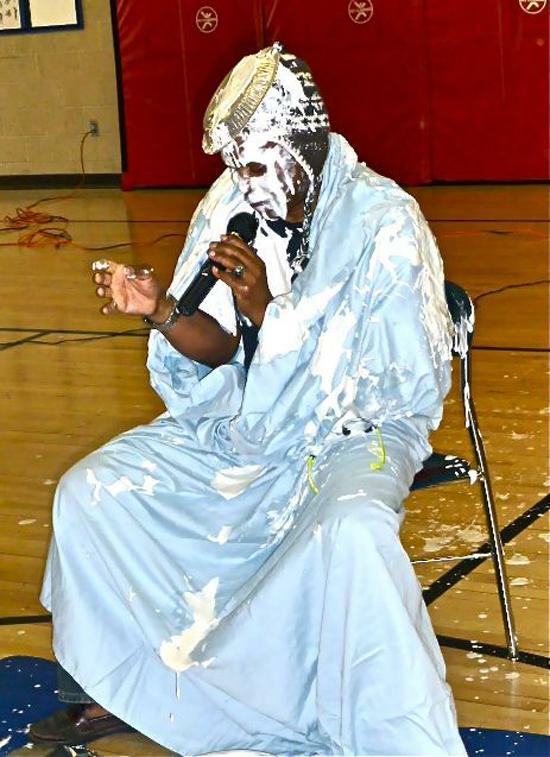 ANSONIA — On Friday, students who were the top readers in a challenge that John C. Mead Elementary School Principal Terri Goldson launched in September got their reward: An opportunity to throw pies in Goldson’s face. The students threw whipped cream pies at Goldson, who donned a hat, sunglasses, a towel and a sheet for the event. And that was a good idea, since Goldson was covered with whipped cream in a matter of seconds. The gym erupted in squeals of laughter and applause as he tried to wipe the whipped cream from his face. Click here to read the full story: Ansonia reading challenge worth a pie in the face- The New Haven Register – Serving New Haven, Connecticut. Next Next post: Connecticut School Districts thrown under the bus as Commissioner Pryor ends successful technical services program.